Douyin or as it is better known outside of China -Tik Tok, is a social media app developed for the next generation of content creators. Through Douyin, users have the power to quickly create and share their own unique, 15-second short videos. From comedy to dance, or free-style, or performance, Douyin encourages its users to let their imaginations run wild and show the world their forms of self-expression from the comfort and convenience of their smartphones! Douyin features an array of built-in special effects and stickers (similar to the kinds of features you find on Meipai, Snapchat and other social platforms) all powered by AI Technology, bringing videos to life through the use of body movement-recognition software. Launched in September of 2016, it had 150 million users before enveloping Musical.ly, which boasted 100 million unique users of its own. Now, the branding on Tik Tok includes “musernames,” the same lingo Musical.ly used with its “musers,” and the app icon itself is the combined logo of both Tik Tok and Musical.ly. Upon downloading the app, you can watch Douyin videos without creating an account — but if you do decide to build your own profile, you can follow other “musers,” like videos, and, of course, make your own. Douyin users are also quite young with the average age of users being under 24. Having grown to about 154 million monthly active users, Douyin was the 6th most downloaded app in the world in the first quarter of 2018, combining iOS and Android app downloads. 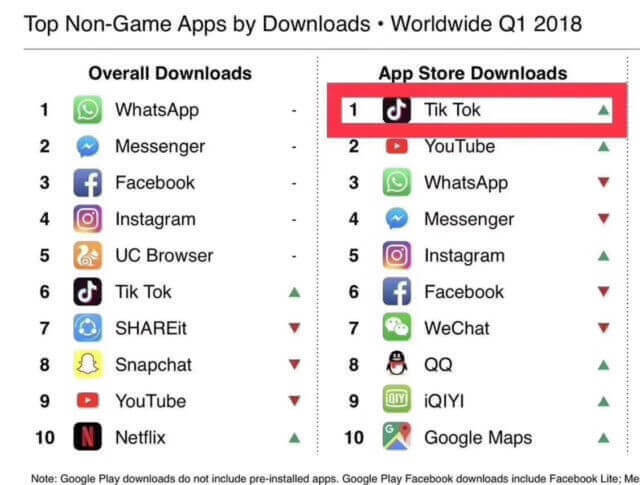 It was also the most downloaded non-game iOS app in the world, beating such big names as YouTube, Instagram, Facebook, and WhatsApp in download charts. Considering that Android users in China have to download the app from third-party stores (as Play is banned), Douyin has successfully established a strong international presence, especially in Asian countries like Thailand, Japan, Indonesia, and Vietnam. At home, Chinese youth love the fun and quirky content. Data from Jiguang shows that 43% of Douyin users live in first- and second-tier cities, the developed metropolitan areas. Douyin/Tik Tok has climbed the app store rankings around the world, especially in Asian countries. The app is integral to the global entertainment empire that Beijing-based Bytedance is building. Douyin/Tik Tok as a result poses a threat to Instagram – the most popular picture and video sharing app to user in Asia. To efficiently get higher user growth, Douyin started to raise KOL’s (Key Opinion Leaders) to reinforce the power in and across its social network. It selected Weibo as the first marketing platform and let them share their videos with the Tik Tok logo. In addition, they also unveiled how the video produced for the campaign, lured audiences to imitate it. More and more similar videos spread to other apps, giving rise to many series of short videos. Douyin is attracting attention from brands, too. It recently teamed up with fashion brand Guess on a denim campaign to target Millennials and Generation Z on the platform in September. Facebook has taken notice of Tik Tok’s rising popularity, and even launched a competitor app called Lasso. The app lets users create and share short videos with music and camera effects. How Can Brands Use Douyin? Close ties with KOLs (key opinion leaders) contribute hugely to the exponential growth of Douyin’s popularity. In fact, Douyin itself has contracts with hundreds of KOLs to ensure that their promotional content goes through the official channels with required fees. Although direct partnerships are much more expensive, it is a way to ensure visibility of your campaign, which in turn would stand a better chance for the campaign succeeding in reaching its target audience. Without working directly with the platform, sponsored content that bypass this official “agency” can get taken down or find it challenging to achieve viral success. Another option is to work with an agency like APV who can work directly on your behalf to achieve the results you are looking for. Douyin has been quite creative in opening channels and unique ways for monetisation through marketing on the platform. With a massive user base and inevitably more growth on the way Douyin is already well past the beginning of its hype cycle, so it is not cheap to create, curate and run a successful campaign on the platform anymore. But for any brand wanting to target young affluent Chinese users, the return on investment still likely to be very high. The time for dipping the toe in the water is almost passed so dive in before you miss out and your competitors reap all the rewards.